We are so grateful to have Kasey/Brad rejoin us at Soul Life Times Magazine. Let me reintroduce them to you for those that have not experienced their work. 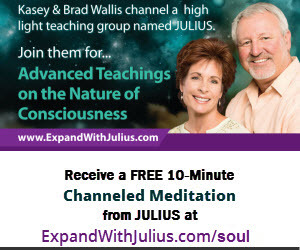 Kasey/Brad are a delightful, loving husband and wife team that just happen to channel a multi- dimensional intelligence named Julius. Though they will say "we are just ordinary people", they truly are having an extraordinary life journey. Through Julius they are bringing advanced teachings on the nature of consciousness about how to become the highest version of themselves. As I spoke with them again I was excited to find out what was new with them. Kasey revealed that they have been trying on different things as they have been trying to figure out where Julius fits with an audience. Brad is now a contributing writer with Gaiam TV. Of course Kasey/Brad and Julius are always dedicated to their students. We discussed what topic was coming up for them to bring forward and most definitely what came through strongly was a discussion with Julius about the Auric Field. Kasey and Brad want to have a dialogue of what the auric field is and the energy frequency of the auric field. As Kasey says, "everyone always tries to tie it into many modalities and we would like to bring clarity to what it truly is". Julius's take on it is very expansive which will allow the readers to get the intensity of Julius. Julius will explain how we as humans can and do become all that God is. We would love to discuss with you the depth of what you are...what are you doing on this realm, what you are as a physical being. What governs you is thought. You process it continually. Most of you are not aware of the thoughts you process. There are thoughts in relationship to all different states of consciousness. Let's talk about how this works. Let's talk about the difference between the spirit and the soul. The spirit is the inner being embodiment that holds your physical embodiment together. It is connected to all energy everywhere. It can be defined as consciousness. All energy that exists everywhere. In an ongoing state of contribution and receivership. This is what we would tell you is God through definition. That is an energy frequency that contains all thought. Everything comes from a thought first. Your spirit is an electro-magnetic field that energetically pulls the physicality of your embodiment together. There is spirit around every single sub-atomic particle of your body. It doesn't just surround the outside of your physical embodiment, but you have an encasement of energy around every nano subatomic particle in your physicality. You have spirit woven through your body and it is what holds all the matter together. Without it you just fall apart. Your physical is not solid. You are very porous. Your liquids should be spilling out of you...and science can't figure out why it doesn't. It's because it has a spirit to it and it is a conscious agreement to be held together and it is connected to energy force everywhere. Your spirit is never disconnected. It's an impossibility for your spirit to be disconnected from Source. A Soul is the emotional processor of thought. It converts a thought into an emotion so the thought can be experienced. It is how manifestation works. You capture a thought. You have a perspective about it or a feeling about it. This is your soul stepping up and engaging in the relationship with this thought. It sends it out and it literally becomes. It becomes you and it becomes all of spirit. You are a soul. The soul was launched when Source desired to know itself as the all. It needed to be able to take itself and expand. It did that by launching itself in a lower vibration where all souls were creating. All of you are expanding God at such a rate through your own thought acceptance and perspective processing. In a physical embodiment you have inserted your soul but the spirit carries the body around. The soul is inserted inside the embodiment. The soul sits deep in the chest cavity. It is a cross pointed energy underneath the heart where electrical currents come into play. You can't see it. A tiny pin point of light that has more energy to it than you can possibly comprehend with your finite mind. You use the spirit of God to move you around through space. The soul and the spirit are connected but they are not the same thing. Everything has spirit to it. Everything that can process a thought has a soul. All around you is a pool of thought or God in all thought possibility of anything. Anything you can conjure up you have pulled out of the pool of thought. Humans believe that a brain creates thought. It doesn't. It processes thought. This is how it works. You have an auric field around your physical embodiment. It is a combination of seven energy bands expanding out of your embodiment. It is in direct correlation with seven perspectives that you can have as a physical being creating a world, an experience for yourself. We refer to this as the seven seals or states of consciousness or the states of being that govern your perspective. Everything from a survival base, instinctual, violent, reactive creature all the way up to a Christ consciousness embodiment that can move mountains and change water, manifest things out of thin air, heal every component of possible awareness and ascend themselves off of the physical realms. The only difference between those beings is the seals of consciousness that they live in and create their world from. Every one of those seals activates are co-inciding frequency bands. If you are first seal consciousness being frequency you only have one energy bandwith ignited. You are very violent, you are very reactive, very paranoid, ignorant, competitive, and your world reflects that. If you are working on raising your consciousness you can hit all the way up to the sixth seal of a physical embodiment and you pass through a seventh as you are ascending your physicality off of this realm. Your auric field is a demonstration of that through coloration. You can look at someone and the coloration in their auric field is a blending of their state of consciousness and energy they emit. Their coloration, seals of consciousness, the energy bandwidths are not identical. They have variables to it. The blending creates the variable hues that you see around the physical embodiment. What is this for? The auric field works as both a receiver of thought and a contribution of thought into all consciousness or the pool of thought that is all around you. Thought lives in the whole pool of consciousness but thought has different frequencies to it. Every given thought that you can conjure up you can look at from a fear based or low frequency, to a love based high frequency possibility. You can take a thought and put a new spin on it and have a different experience with it simply based on the way you see that thought and the frequency with which it is activated. Your auric field is the decipherer of the frequency of thought that you take in, process, create from, have an experience with, and then you throw it back out your auric field back into the pool of thought as an expanded version. You have an auric field and your field is operating at a frequency. That frequency attracts like energy frequency thought. It is drawn to you like a magnet. It comes into your auric field and your brain accepts it based on the frequency match and it processes it. This thought penetrates your auric field and hits your brain usually first in the left frontal lobe which is where your logic processor is. You decide if you are going to accept it or not. Most humans process the same thoughts a lot. Your soul jumps in and has an emotional response to that thought. That thought travels through your embodiment as an electrical current. Thats what your circulatory system is for. It takes the thought that you have just accepted and transmits it through your physical embodiment as an electrical current and you literally feel the thought that you accept. Your body is the thoughts that you accept actualized. You are what you think about as a frequency. You project this thought out. This thought goes back out through your auric field and back into the pool of thought. The thought you had processed at the frequency for which you processed it. Many humans don't really process any thought higher than how they accepted it. They don't expand it. They simply accept the thought. It's familiar. This creates a very mundane low frequency life. You don't have energy. You don't have enthusiasm as bandwidths are very low. You probably only have two bandwidths that are activated. So you're accepting and processing thoughts that are low and you're projecting thoughts that are low. Your auric field is a catch and deposit for the pool of thought. Low frequency thoughts decay the body. That's why you age. Do you know you were never intended to age. When you first came in a physical embodiment you didn't age because you knew who you were. You knew who you were...a light being in a physical form. You knew that you were God in form. You were so damn happy to be here and demonstrate thought from the highest frequency of possibility that you remained resilient for thousands of years. High frequency thoughts processed through your circulatory system constantly rejuvenate you and rebuild you at a cellular level. That is what your body is designed to do. Your body could last into forever if you knew how to work it through a conscious thought application. But you all got lost in the physical realm. You became fear based...you became competitive...you became paranoid and this became a low frequency in physical embodiment and you started to erode. This is how disease takes place and chronic conditions take place. This gives you your power. Everything that is wrong with you you are doing based on the thoughts that you process. This converts into a genetic pattern that you pass on into a family. The great thing is that you change any genetic pattern by changing the way you think. Your auric field pulls in thought, you process thought, you expand the thought by processing the thought and you turn it back out into the pool of thought. The next person that comes along has the opportunity to grab the thought that you just expanded and expand it and send it back out and this is how God refines itself. You are God in form refining itself. That's how every single human has the ability to become all that God is because you will process all thought in an ongoing state and you will rise it and expand it, refine it and then you will become that refined thought again. It is ongoing. What humans are doing for more than ten and a half million years. Unfortunately since you have disconnected yourself from your knowing, mostly all of you have never gone above the second seal of consciousness. So you reincarnate yourselves...you're angry, you're competitive, you're full of remorse and guilt. You believe in punishment and reward and you come up with a deity for that reward and you come up with a configuration of satan that punishes and it is that perspective alone that keeps you locked in the reincarnated process. Along the way there have been light masters of consciousness that have come to teach you of the possibility of yourself. In order to aid you to know yourself further as a living being so that you can get on with it. And you can do other things and have other experiences the higher you raise your consciousness, your state of accepting thought. Dropping judgement means you drop judgement of thought. The more you are open minded and accept thought possibility this activates your other energy frequency bandwidth. The way you raise your frequency band is to broaden the way you think. It's an automated system. Your energy bandwidth will expand and you attract other high frequency thought and your life will become expanded. You attract everything in your life. Everything in your life is an energy match to who you are. If you are a fear based being everything in your life is a bummer. You have horrible relationships, you get bad jobs, you always get sick, everyone is leaving you, and you have no money. As you become an expanded consciousness being and move away from fear your frequency bands ignite, you attract everything in your life that reflects possibility or has a love based vibration to it. Your life is wonderful, your relationships are wonderful, your job is wonderful, creativity flows and you live in joy. You eventually are able to ascend your physical embodiment off of this realm and can realize in any configurement you desire and never go through an amnesic state again. That's why we come to teach you of enlightenment. So you can get the hell off of this realm that you are so miserable in. But better than that to see the realm as the infinite possibility that it is and utilize it to live the most expanded life which will inevitably aid you in ascending your embodiment as well. Your auric field is the receiver of thought and the contributor of thought to the all. It is how you are God. It is how all is expanded. Therefore it is how you ultimately expanded as the all. Isn't that Fantastic!